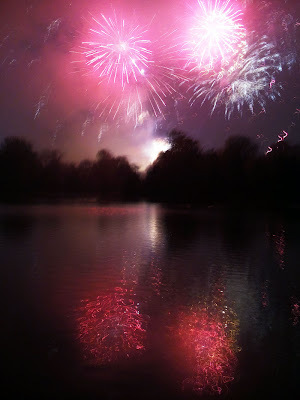 I didn't have my camera at the fireworks last night but managed to take this with my phone for you. Fantastic! What was the occasion? I like the photo very much, blurry and colourful, almost like a painting. I didn't go out to see any foreworks displays yesterday, just heard the neighbours firing off their rockets etc. Holy crap - your phone takes nice shots! Great capture - especially for having been taken with the phone! Not a bad phone photo but for what was the celebration? I am always amazed at how good the cameras are in cell phones these days. This is great. I probably mentioned this before but about 6 years ago I was traveling back to London from Wales on November 1st in the evening and it seems like every town we passed through was having a fireworks display. It was fun to see. Very impressed with how this turned out! Where did you decide to watch the fireworks? All that from such a small package, and you can speak to people on them as well! Wow. A spectacular and colorful image, great work! Super shot from your phone! How wonderful to have fireworks to cheer up the November skies! I want to get this for my PC wallpaper! What a fantastic image! Love it. For a shot taken with a camera, that is not bad, not bad at all. Iphone maybe, given the quality? That is a fabulous shot, nicely captured! Can't believe it is a phone.